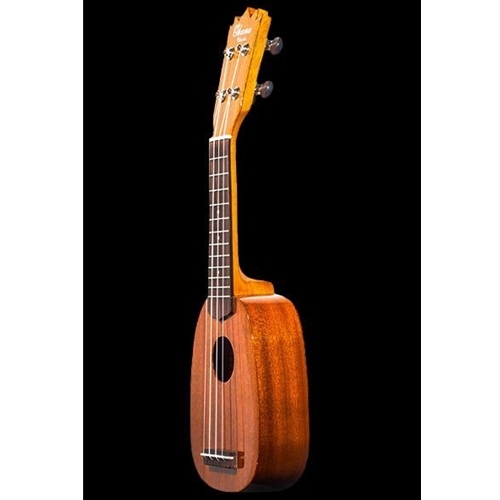 The new Ohana teenie tiny pineapple ukulele, TTPK-25G, features an all-solid construction on a sopranissimo size. Measuring a total of 17 inches, this teenie tiny ukulele is truly the perfect traveling companion. Even though it’s smaller than a typical soprano, it still holds the regular G-C-E-A (C tuning), but can also be tunned up a step to ADF#B (D tuning). The new TTPK-25G is an addition to the existing models in sopranino, soprano and concert size, and is made with the same attention to detail and quality Ohana is known for.